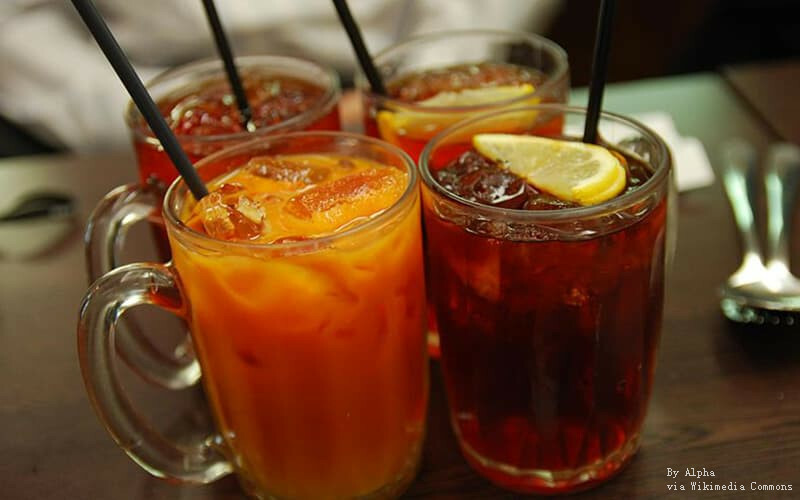 When we talk about the most famous and delicious Thai drinks, Cha Yen (Thai ice tea) undoubtedly is the champion. The impeccably blended orange color has attracts lots of eyes and the charming punch of sweetness has won millions of tourists' hearts. It is fabulous color, friendly flavor of milk and brewed tea leave complement so well with the attracting aroma that is creates a perfect drink for everybody. When you are travelling in Thailand, these flavorful teas will let you forget your lovable coffee, no matter how much you are addicted to it. You can choose to drink the hot or cold. Cold is more popular. Cha Yen is easily found and the price is cheap. If you buy it by the street, it is only 15THB to 20 THB. If you order in a restaurant, the price will go a bit higher depending on different places. Oliang (Thai iced coffee) is similar to Americano but not exactly the same. It is another traditional drink of Thailand and it is very popular. Thai people mix other ingredients in to the coffee. The ingredients depend on the recipe but can be caramel, corn, sesame seed or roasted rice roasted with coffee beans. The results in a unique flavor tasted like Americano. Oliang is quite easily found everywhere at street shops or motorcycle food carts. Pomegranate juice is freshly squeezed that is one of your best weapon to sweep the unforgiving hot of Thailand. When you order it, you can witness as the inside of the fruit of your choosing is smashed just in front of your eyes and put into a slender plastic bottle. Pomegranates are good for health, because they contain plenty of vitamin C and fiber and antioxidants. So it loved by a lot of women either the locals but the overseas travellers. Many of the Thai drinks are full of sugar but this one is sweet but without any sugar. So it is quite nice to drink as it is really good to your body. The authentic orange juice is one of the most popular drinks in Thailand and it can be found everywhere you look and on almost every street in Bangkok. 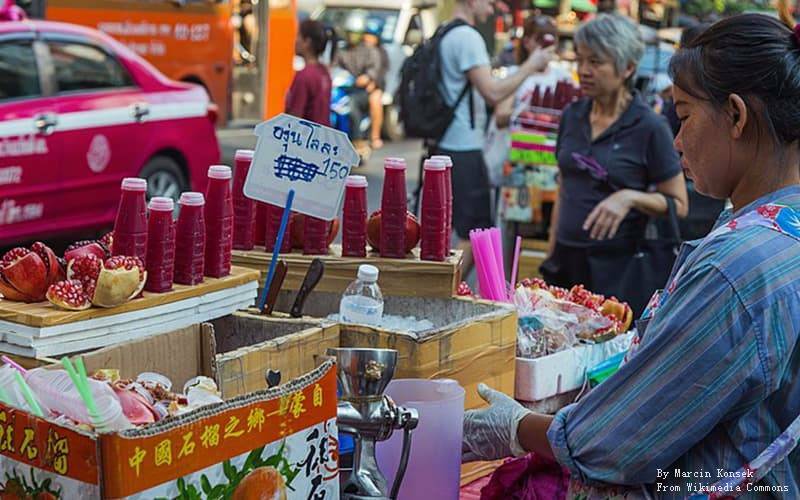 Thai people are used to add some sugar or salt, ice, syrup and flavoring into the juice making for an interesting combination. However most of foreign tourists do not like this way. They like 100 % fresh squeezed orange juice. So you can order the “no water, no sugar” one or you can try Thai people's way. It all depends. All of Thai people love grass jelly. Black grass jelly is mixed with both ice and water before being sprinkled with brown sugar. Some people like to add grass jelly to some desserts like coconut ice cream but some people like to add this strange ingredient in their drinks. You can put grass jelly into different teas, juices and more. You will see your cup partly filled with jelly grass, giving you the option of filling it up with whatever it is you desire. Smoothies of Thailand are always elaborate. From watermelon is scooped into its own bowl then to a freshly blended combination of dragon fruit, apple, and carrots or more. You will never go wrong by ordering one of these drinks. Most of these smoothies are health benefits. According to your favorite, you can order what you like. For example, if you want something help your digestion, you can order a pineapple, orange and apple smoothie. Thailand's delicious fruit is variety, both throughout the year. Many of them you might hard to eat at home, so take time to indulge during your trip in Thailand. Nom Yen is a very creative drink invented by Thai people. You may just drink a cup of hot or cold milk, but Thai people add colorful syrup into it, making a new kind of beautiful delicious milky drink called Nom yen. It is quite popular among children and teenagers and those who can not consume any kind of caffeine drinks in Thailand. Local people usually enjoy Nom Yen with a set of streamed bread and a Kaya dipping (coconut jam). You can easily find Nom Yen at the street shops. The price is quite affordable from 15THB to 25 THB or from 30THB to 60THB at a café. Thai beer is a very good tool to beat the intolerant heat in Thailand. Beer drinkers can satisfy their taste buds with Singha Beer or Chang Beer. These two beers are very popular in Thailand. Chang is strong beer and it is famous for its cheap rates. Singha Beer is the oldest beer in Thailand. It contains a little bit sweetness with fragrant of fruits. The strong type has 5.8% alcohol while the lighter one contains 3.5% alcohol. Chang and Singha are quite worthy of having a try and they are really attractive with a great of exotic Thai favour. These two beers constantly battles for the number 1 place in Thailand. Want to have a taste of authentic Thai Food when travelling in Thailand? UME Travel helps you to achieve the goal. Find our highly recommended Thailand food tours combining must-see sights in Thailand with carefully selected food and restaurant.